If you’re a mom, it may be tough to find time to exercise. One solution is to work out at home. If you want to get fit in 2017 without missing out on precious time with the kids, here are some suggestions to try for size. Do you have a DVD player at home? Have you got space in the living room? Have you got some gym clothes and sneakers? If so, you’re all set for a home workout. There are tons of workout DVDs out there, and you can choose a style that suits your fitness level and your workout preferences. You can dance those calories off, let off steam with boxing moves or set your heart racing with a high-intensity interval training session. If you’ve only just started exercising, don’t be put off if you find the first workout impossible. You’ll often find that there’s a lower intensity option for many of the exercises, so follow that, and you’ll soon notice a difference in your fitness levels and your body shape. If you want to keep track of your progress, it may be worth investing in some body fat scales. This website will provide you with reviews and tips. Yoga and Pilates are great for busy moms because they help you relax and enjoy time out, as well as increasing your heart rate and strengthening those muscles. You can follow a DVD or download some workouts from the Internet. If you’ve been to a lot of classes in the past, you may not even need any guidance. Choose a quiet spot, and enjoy half an hour of blissful peace. If you haven’t got time to go to the gym, don’t panic. If you love working out on the treadmill or lifting weights, you can do this at home. You can buy gym equipment from online stores. It’s also a good idea to look out for bargains on neighborhood buy and sell sites and online auction sites. You don’t need to buy every machine you’d find in a professional gym. Even if you just buy a single piece of equipment, this will still enable you to get a good workout in without leaving home. If you’re lucky enough to have a pool, take advantage of it. 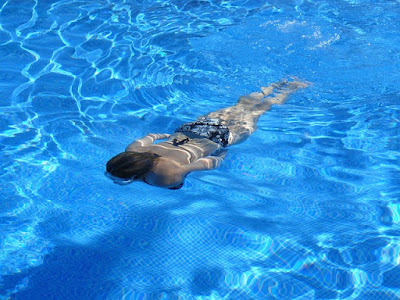 If the kids are at school or you can get a sitter for an hour or so, take yourself off to the pool and do some lengths. Swimming increases your endurance and lowers your resting heart rate. It can also help you to build muscle mass and improves your circulation. Swimming is also suitable for most people because it doesn’t put pressure on your joints or increase tension in the muscles. If you have back pain, for example, this is a great option for you, as the water supports your body weight. Many people also find swimming enjoyable and relaxing. A lack of time should never be an excuse for not working out. If you’re a busy mom, there are solutions if you can’t get to the gym or attend regular classes. Hopefully, these at-home workouts will have you feeling tip top in no time. That's true... no time is no excuse. Thanks for sharing these.